In just 2 days, become a more confident, accomplished Excel user, banish "spreadsheet phobia" forever and discover how to get more out of this powerful program than you ever thought possible! Can you really "master" Microsoft Excel in just 2 days of training? You bet you can! This is Excel training at its most efficient and effective. You will learn how to create spreadsheets, input data, perform mathematical calculations, develop workbooks, edit cells, and use formulas, functions, Wizards and much more — all under the watchful eye of your expert trainer. This fast-paced, intensive journey through Excel's exciting capabilities — combining lectures, trainer demonstrations and group discussions — will develop your skills like no other training seminar. You can learn more in less time with our proven computerless, hands-off teaching approach. You'll be able to concentrate and learn without being slowed down by keyboarding or having to wait for the entire group to catch up. (And doesn't a day away from the computer screen sound great?) Every key point and significant Excel operation will be displayed on a large, viewer-friendly screen. Once you've returned to the office, you can try everything you've learned at your own speed and convenience with the techniques summarized in your complimentary workbook. But why would you? This course is carefully designed to deliver the most information in the least amount of time. Through research, interviews and client input, we've found that a 2-day seminar is optimal for this type of material — long enough to learn everything you need, yet short enough your department or organization won't fall apart without you. Our expert course designers have distilled the essentials of Excel from books, manuals, CDs, courses, IT experts and, of course, their own extensive personal experience. 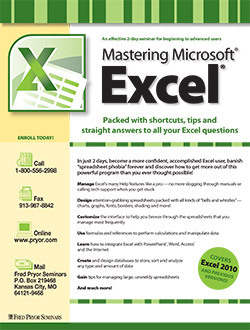 As a result, this training represents the "best of the best" — all of the Excel knowledge you need and none of the extraneous elements you don't. *NOTE: This is not a hands-on workshop. Instead, you'll learn via "computer-less" training that makes every moment count. Learn your way around the Excel window and discover the purpose behind each menu, each toolbar and all those “little boxes” known as cells. Navigate your way around Excel’s many toolbars and panels: they’ll make your Excel projects shine! Consult Microsoft Excel’s Table of Help Topics — it’s packed with information, just waiting for your questions! Dress up your worksheets, reports and financials with lively, attention-grabbing details like clip art, imported graphics, drawing tools and much more! Let AutoCorrect catch and correct the mistakes you make most often! Use the Format Painter to quickly and effortlessly format entire cell blocks, with just a keystroke or mouse click!